19th February. Posted in Guides. If you are running any kind of website, it’s a good idea to find out as much as possible about how your users are interacting with your website. You’ll want to find out if they are having any problems on your website so you can address the issues and make it easier for your users to complete any goals you have. All websites have some kind of goal. It could be to increase signups, buy a product, read the end of an article or share something on social media. Problems with your website could seriously impact these goals, so let’s learn an easy way to discover what problems you may have. There are lots of tools available to help you learn more about how your visitors use your website. Some of these tools can be quite complicated. Some can be quite expensive but the tool we are going to use is both very easy to use and free (for a limited number of visitors). This tool is called Hotjar. A heatmap will show you a visual representation of the most viewed and least viewed areas of your website. Areas that visitor’s view the most will appear red and areas the visitor views the least will be blue. You’ll be able to quickly see if users are scrolling down your website and which elements on your website are catching your visitors eye. Imagine you have a newsletter sign up widget on your website. 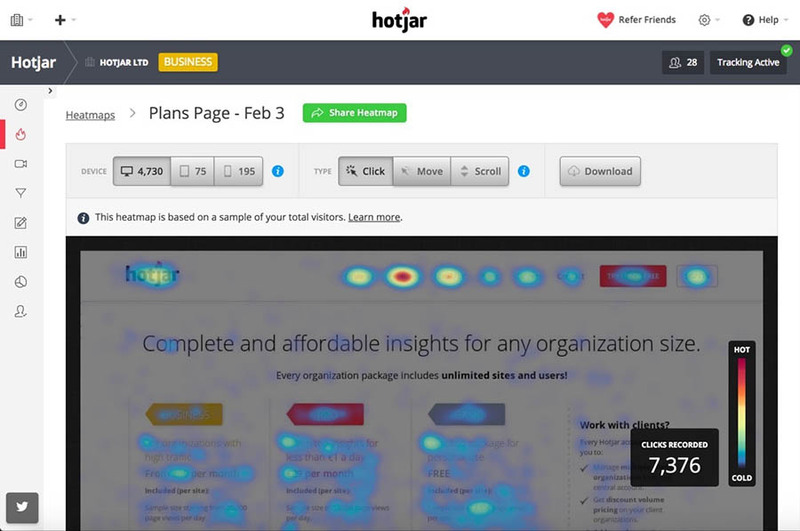 By using the heatmap tool you’ll be able to see if users are noticing it. If it’s not performing as well as you want, you could move it to different area and compare the performance of the new area. This is my favourite feature of Hotjar. You’ll be able to log in to Hotjar and view videos of users activities during the time they were on your website. You’ll be able to see them scroll around, click on things and navigate between pages. This feature works equally well on desktop or mobile devices. Live recordings can give you some really useful insights on your website. You’ll be able discover issues and identify trends that you may not have spotted by looking through Google Analytics. Hotjar does much more than just heatmaps and live recordings. You’ll also be able to set up conversion funnels, see how users interact with your forms and you’ll be able to set up feedback requests and surveys. All of these features are awesome but I think they are best left people with some experience of optimising websites. To get started, heatmaps and live recordings will provide a couple of simple ways to get feedback for even complete beginners. When you’ve gained some valuable insights through those tools and you would like to learn more, you should find out more about conversion funnels and how to elicit useful feedback from users. If you try to set all these things up right away with no experience of website optimisation and user experience design you’ll probably find yourself getting a bit lost. The best news of all is that Hotjar is totally free to get started with. The free package is limited of course but you’ll still get all the amazing tools I’ve talked about here. The free plan allows you to collect data from 2000 page views per day and you can store 300 live recordings and 3 heatmaps for up to 3 months. Once you’ve used this and you want to collect more data you would need to upgrade. The next available package for personal users costs 29 euros per month but you are under no obligation at all to ever upgrade. Many premium WordPress themes have an option in the admin area to insert custom code. This is usually done through a theme options panel or via the customizer (Appearence → Customize when logged in to WordPress). If you are comfortable editing theme files and uploading via FTP then you can open up your theme, find the footer.php file and paste your code in before the closing body tag then upload your file. As we are working with WordPress you probably wont be surprised to learn that there are multiple plugins available specifically for adding Hotjar code to your website. The most commonly used one I’ve found is called Hotjar Connecticator. This method is good for beginners but I’d avoid plugins if possible to avoid extra bloat being added to your website. 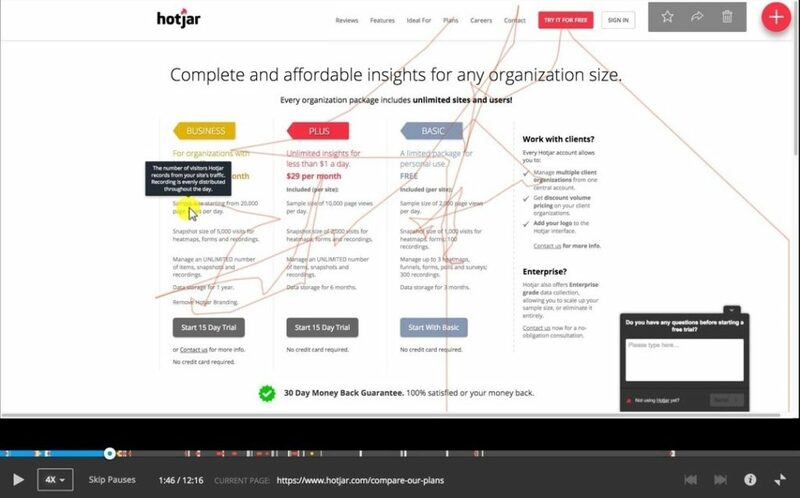 Setting up Hotjar on your website is a no-brainer. The 300 live recordings you get for free are very interesting and can give you some vital feedback that could really improve your website. Even if you set up Hotjar and find out that users are not having any issues with your website it would still be a good idea to set up just confirm that there are no obvious issues with your website. Wow. I had no idea you could even do live recordings on a website like that! I’ve been creating websites for about twenty years and I’ve learned you really want to see what visitors are doing. I remember the days of yesteryear when counters were the only way you could tell how many people were stopping by. Things have improved quite a lot and I am intrigued by what Hotjar offers. It seems like a good way to make the most of your online outreach.